The Saline County Sheriff’s Office welcomed a new deputy on Wednesday, October 3rd. Eduardo Grajeda was sworn into office by Saline County Circuit Judge Robert Herzfeld and will be assigned as a patrol deputy. Dep. 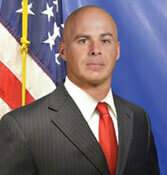 Grajeda comes to the Sheriff’s Office with two years of experience as a police officer.